At Skylens we have a fleet of UAV’s meaning that we can cater to our clients needs and create the footage they require in the format they need. Our footage is suitable for a selection of output ranging from website to film / TV use. Using our UAV systems we can fly between 1m and 120m high to produce images that are stunning. Follow the action with a “fly-through”, under or over bridges to produce footage that is unique to this type of system. A live view from the camera is displayed on the ground station in real-time, allowing the client as much or as little input as they would like. The UAV’s constantly update their positions using GPS and hover in position hold without any operator input. They also have various safety features including a dual-signal control transmission to ensure there is always full control of the vehicle and an auto landing in case of emergency. 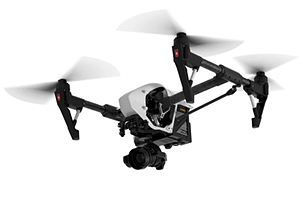 These systems have very stable flight characteristics providing smooth video footage and quality stills. The Skylens UAV’s are operated by a qualified photographer (BA Hons) so the client is safe in the knowledge that we know our business and also have an eye for an image! The Inspire Pro carries the X5 camera producing high quality stills and 4k video. Operated by a two man crew the quality of the imagery from this UAV is stunnning and allows access to areas that some of the larger craft cannot enter. The low light capability of the camera with a F1.7 aperture lens and the ability to use a slow shutter speed means we can shoot amazing dusk time imagery. See our VT pages for examples. The S1000 with MOVI M5 gimbal. This UAV carries any camera up to a Canon 5d, including the 4k Panasonic GH4. 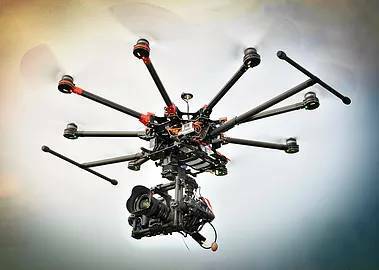 It is operated by a two man crew consisting of a pilot and separate camera operator controlling the Movi M5 gimbal. The Movi is the final word in stability combined with flexibility allowing the client to choose which camera we shoot with. The live view from the UAV is transmitted to the ground to view in real-time. The 360 degree rotating camera head enables stunning shots to be captured. Video footage from this is ready to use without any need for stabilising in post production. This Movi M5 gimbal can also be released from the UAV in minutes providing a “steadycam” facility on the ground. We hire the MOVI as a stand alone unit. Contact us for more info. 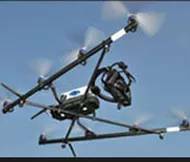 The F8 is an octo-copter – a UAV (Unmanned Aerial Vehicle) specifically developed for aerial video and photography. The F8 eight rotor electrically – powered vehicle with a stabilised camera head is able to fly and hold its position in winds up to 10m/s (20mph). It is very quiet in flight allowing us to film in areas that may be sensitive to noise such as in the vicinity of animals. This machine carries an optically stabilised HD (1080-50p) camcorder for film/video projects. This smaller machine can be operated by a single person and is suited to operations where space may be limited such as indoors. The F8 is under the 7KG limit imposed by the CAA for flight within restricted London airspace. This machine carries a Sony NEX7 for stills producing 60Mb files. This machine has the enhanced CAA PfCO for 20m seperation from people and property not under our control. The Phantom is our smallest UAV producing amazing stable footage directly from camera. The GoPro camera is mounted on a Hd-3D 3 axis stabilised mount. This machine is ideal for indoor flying or where outdoor space is restricted, such as city centres or “congested areas”. It is transported in a small case that is easy to carry between locations. Set up time is quick and this is a cost effective option with a single operator. The live view and all the telemetry data is transmitted to a monitor on the ground. 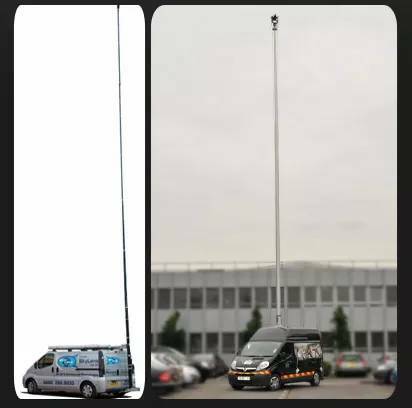 The masts we use are pneumatically operated heavy duty military specification systems and each has a remotely controlled camera mounted on a pan/tilt head giving a live view on the ground. The Skylens mast-systems can be set up virtually anywhere, from city centres to the middle of nowhere. When in use the vehicle based system takes up no more road space than the vehicle itself occupies, which in areas where space is at a premium is vital. This gives us a big advantage over trailer-based systems that need a number of parking spaces or a much larger area to be used. The images are viewed real-time on a ground station screen allowing full control of pan, tilt and zoom and exposure on the camera. Still images are available from the masts using a range of DSLR’s in addition to Semi-compact cameras. Video is shot using professional full HD 3CCD cameras with full variable speed control of zoom.